This evening I made a quick and simple meal. It was another unseasonably cool day here today, not to mention a day filled with monsoon-like rain. We actually still have our heat on at the end of April believe it or not. I may have run the air conditioner for 2 days when we had a few warm days in a row a month or more ago. So, it was a good day to have the oven running for dinner. I picked up a package of boneless skinless chicken thighs and trimmed them and cut them into nice big chunks. I also picked up a Vidalia onion. 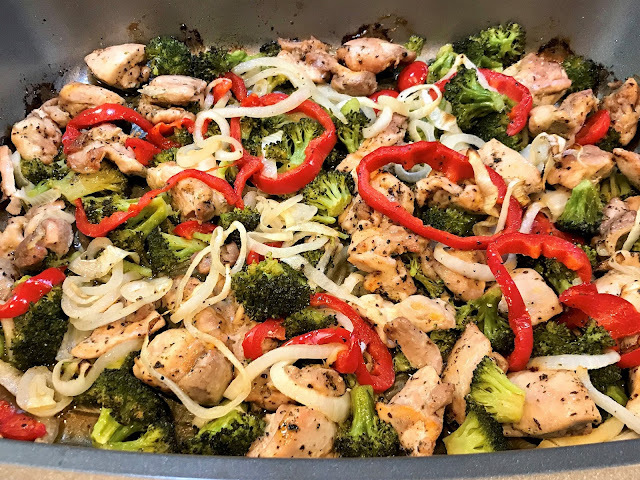 I already had fresh broccoli and red bell peppers in the fridge so I used what I had on hand to add to my roasting pan dinner. It turned out so delicious and everything cooks together and the flavors meld and juices mingle as the meat and veggies roast together. I served it in shallow bowls and topped it with crumbled feta cheese. 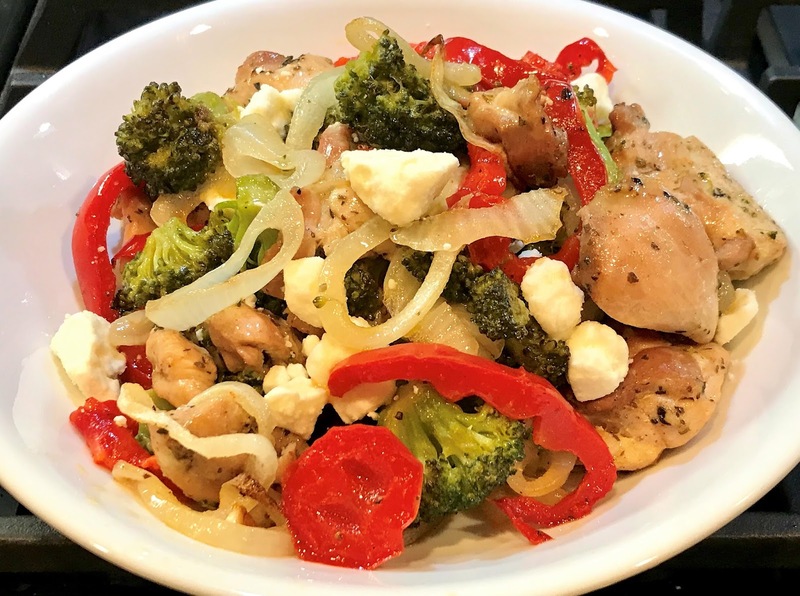 The flavor of roasted chicken, herbs, olive oil, sweet onions and sweet bell peppers topped with tangy salty feta cheese was a perfect meld of flavors. I snapped a couple photos below and included my easy peasy recipe. Enjoy! Preheat oven to 425 degrees F. In a medium mixing bowl, drizzle broccoli with 1 tablespoon olive oil and spread in a single layer in bottom of nonstick roasting pan. In the same bowl, toss red pepper rings with another 1 tablespoon olive oil. 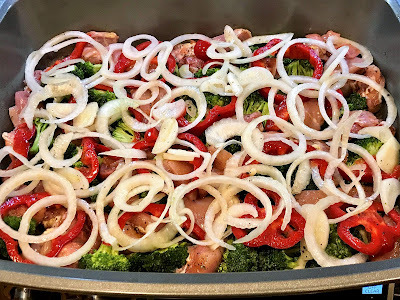 Scatter red bell pepper rings over top of broccoli in roasting pan. Using the same bowl, toss sliced onion rings with 1 to 2 tablespoons olive oil and sprinkle with a pinch of salt; set aside. In a separate bowl, toss chicken chunks with remaining 2 to 3 tablespoons olive oil and season with salt, pepper and dried basil. Scatter chicken chunks evenly around the broccoli and red pepper rings in roasting pan. Top with sliced onions and roast for 30 to 35 minutes until chicken is cooked and vegetables are done. Serve in shallow bowls topped with crumbled feta cheese, if desired. Wow - this one looks pretty amazing. I usually have chicken of some sort in the freezer and peppers. I'm thinking that there must be a way to get sweetness out of regular onions since I don't have sweet ones and then I'll use cotija instead of feta since I have that on hand for Mexican. Thanks for the great springboard idea!!! This looks absolutely delicious. Will definitely try this one. Right now, there aren't any of the sweet onions around yet, so will have to substitute. Our son doesn't care for thighs, so will mix in some breast pieces for him. As my husband has to watch his salt intake, the feta will be substituted also. I don't like to be changing a recipe so much because then it isn't the original recipe any more. Thank You for sharing with us.